When a company has a strong brand, they need to ensure that the brand is used to its fullest potential and that all their employees (yes, I said all) understand the brand and “live the brand”. What is the point of having a strong brand, if only a few understand it and now how to “live it” when they are dealing with the public? Brand Guidelines help companies educate their employees on their brands. Brand guidelines are an integral part for any company. No matter how large or how small a company is, brand guidelines should be created and implemented. Brand guidelines are not just for marketing reasons either, but also to remind the company and its employees the company’s mission and goals as well as the usage of its logo, tag line, colors and even communication language. That can sound very confining and a lot of employees can feel a sense of anxiety when the mention of a “guideline” is brought up, but it can actually help employees in creating solid branding collateral that effectively conveys the company’s message and image. What exactly is a Brand Guideline? A Brand Guideline is a document that outlines exactly what a brand is, what the mission and vision statements are, any company goals and all the proper usage of logos, taglines, graphics elements, colors, even sample layout guides. Writing Style – Should your communications always be upbeat? Should they have a more serious tone? What style of writing will appeal to your main demographic? Jargon – Should your company use any technical jargon? Is it used in your industry? Does your clientele understand this jargon, or is it only used on a corporate level? Content Format – Should items always be grouped in specific formats or segments? Should writing be concise? Should their be a hierarchy? Layouts – Do you already have a design layout structure for your collateral (e.g. business cards, brochures, fliers, letterhead, etc.) then layout the main elements and their dimensions for ease of recreation. Packaging or Misc. Elements – Do you use marketing gimmicks like CDs, Pens, gift-able Flash Drives? How should your logo or information be implemented on those? This is just a smattering of what could be in a brand guideline. 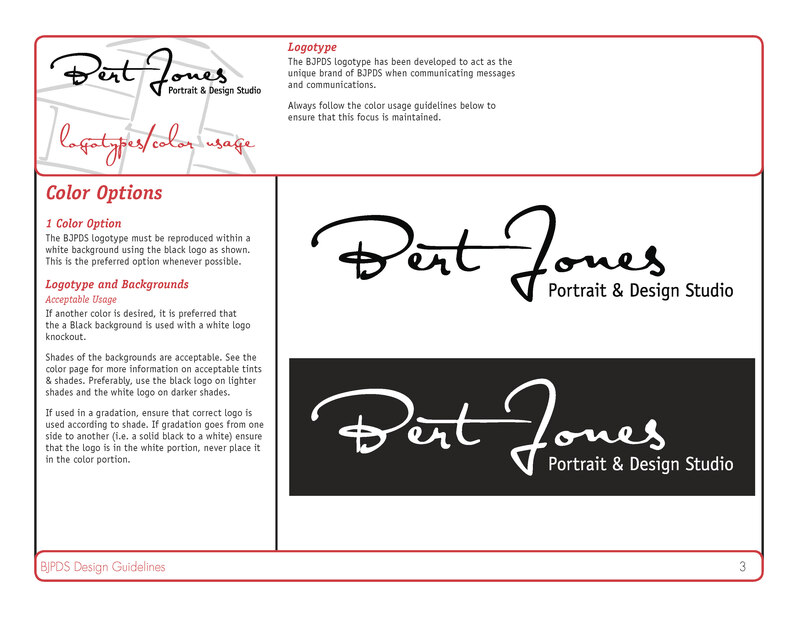 Bert Jones Portrait & Design Studio can work with you to build a cohesive brand guideline. Whether your creating a new brand or need to solidify an existing one, we’re here to help.